It’s nice to see Phil Johnson weighing in on the Whitewashing of Michael Brown, albeit in a very controlled and/or restrained way. The fact is, when you’re the godfather of discernment, you don’t really have to yell. A tweet or two will do. Keep in mind that Johnson – while not necessarily agreeing with the Yasir Qahdi dialogue and saying it is something Grace Community Church would not do, defended James White repeatedly against what he felt was an excess of criticism from Brannon Howse. The IFD Debacle of Summer 2017 and Elephant Room 3, however, are not exactly the same things. Johnson made several tweets in regard to Brown, and they were good resources we thought we would share with you. Here’s an excerpt from that article, which you can find here. This is simply untrue. If he were a lover of God, His people and His Word, then he would abide by Titus 1:9, which requires him to rebuke false teachers. Reasonable people can always disagree about teachers on the periphery. We are talking some of the biggest and obvious heretics on the planet today. Brown also does not welcome discernment. What he welcomes is the chance to appear to be the voice of reason. For example in the comments of this article there is an exchange between him and the discernment blog Berean Examiner about why Brown blocked her on Twitter for daring to ask about his support for Bill Johnson. Brown tried to claim it was because he did not “have the time” to respond to her and instructed her to call his radio show. This is a common tactic for Brown, who seems to have plenty of time to write but never any time to respond in writing. Instead, it is always an invitation to call his show because then he can pretend he is trying to engage his dissenters. Two points on this. First, it is simply shameful self-promotion. Secondly and more importantly, nothing gets resolved on his radio show because he dominates the time, sets up strawmen arguments at the start of any potentially contentious segment and answers critiques and questions with other questions. How do I know? I called into his program after he spent a week on the Benny Hinn show. While Dr. Brown was kind enough to give me ten minutes it was primarily ten minutes of him filibustering, commercials, and nothing got resolved. Nice try. Discernment ministries are not “setting the body right.” They are driving the wolves away from the sheep. You know, as the Bible instructs us to. Not only is this a strawman argument but it is designed to cast aspersions upon those who would seek the truth. By the way, if someone writes something without checking facts or giving enough time, I would agree with Dr. Brown that they are not doing the work of God. But that is not who we are really talking about. True discernment ministries, such as the work of the discernment blog Berean Examiner are not gossip columns. I can give two topical examples from my own ministry. One time a couple of years ago, Brian Houston said in a sermon that Christians and Muslims serve the same God. No question about it. I heard it. I chose not to write about it however until I heard Houston respond to the criticism because it simply was not in his prior teachings. Anyone can make a mistake beloved. Houston may be one of the worst prosperity pimps on the planet but he has never supported Chrislam. Sure enough he came out in a few days and even though he lamely blamed the media, he said he had misspoken. Good enough for me. To this day when people try and level this charge against him I defend him because the only thing that matters is the truth. The second example was when Victoria Osteen said that we worship God for ourselves and not for Him. I gave her the benefit of the doubt for a week waiting to hear if she would say she misspoke. Instead she and Joel doubled down on the heresy and THAT was when I wrote about the incident and how worship within the church has become as narcissistic as Victoria admitted to. The point Dr. Brown misses here is we are not talking about some new preacher that has said something controversial. These are not unknown quantities. The people we are talking about in discernment ministries have established histories of heresy. Years and decades in many cases. They have been rebuked over and over again and refuse to correct their doctrine. While Brown seems infinitely concerned about the wolves, we are concerned with the sheep. There is a price to pay for being deceived by Hinn, Johnson, Houston, and Prince and it is eternal. I find nowhere in Scripture that we are to give wolves the benefit of the doubt and therein lies Brown’s blind spot. To him there are no false teachers or prophets. All are brothers in Christ to him. To people who are discerning, they are wolves and are not brothers and sisters. Jesus teaches us after all, who is our mother and brother except they that do the will of the Father. Johnson also recommended another resource. Always use a moderate and reassuring tone while making extreme assertions and contradictory statements. Make it sound like you’re the most reasonable & intelligent person in any discussion. When confronted with clear and obvious false teaching, end the discussion. “I’m going to cut you off, to be fair to the other callers” or “we’re almost out of time” or “if you continue asking these questions I will have to block you” are all good examples of how to end the discussion. Enable & promote NAR false teachers who claim to “love the Lord,” especially if their ministries are very large. False and un-Biblical teachings are acceptable when being taught by those who claim to “love the Lord” and are hyper-charismatics like Dr. Brown. Pretend to consider opposing views while actually misrepresenting and/or ignoring them. Do not use primary source documents that would quickly and decisively display the heretical beliefs of your fellow NAR friends; instead, pretend that you’re too busy to do any research. For example, instead of admitting that you refuse to review just one or two sermons from Bill Johnson, say that you just can’t take the time to listen to hundreds of hours of sermons. Continually reinforce the notion that you’re a world-class expert on a topic that you cannot possibly do any research on. This is where your moderate and reassuring tone will really pay off. Pretend to be holding NARpostles accountable, while not actually curbing any NAR false teaching. Uphold C. Peter Wagner as a great man of God who should be respected and trusted, while simultaneously overlooking all of his published writings; writings that clearly portray his bizarre and heretical beliefs. Ignore the fact that this “great man of God” is the very person who named the New Apostolic Reformation and defined its characteristics; meanwhile, you can imply that the NAR isn’t even a real thing. Claim to believe in Sola Scriptura (“Scripture Alone”) while you vigorously defend the never-ending (and non-sensical) extra-Biblical revelations from your NARpostle friends. Don’t try to explain how these two things can co-exist, because they can’t. Instead, tell lots of convincing stories about what God told you or someone you know. Refer to the good old days at the Brownsville Revival, where all sorts of weird and disturbing manifestations took place, but tell everyone how wonderful it was. You must constantly assert this belief anyway you can since you can’t defend it from the Bible. Again, a moderate and reassuring tone will help you retain listeners, as you continually make contradictory assertions. Likewise, Phil cited an article on Twitter about “Guilt by Association” arguments. Rich Pierce, President of Alpha and Omega Ministries, took Phil’s tweet to be affirmation of Elephant Room 3, or perhaps, a repudiation of the outrage regarding Elephant Room 3. Ouch. 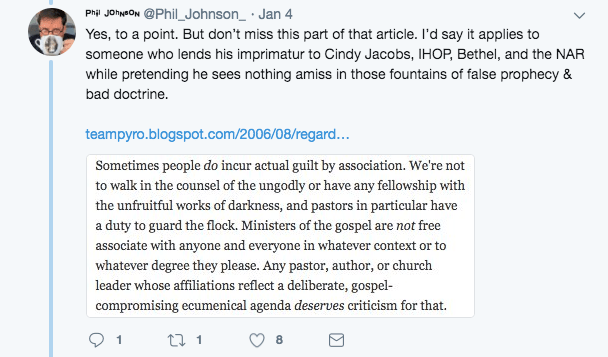 According to Johnson (and the article he tweeted), people do incur actual guilt by association because of the commands of Scripture. And according to Johnson, that applies to someone who lends support to the NAR (which Johnson clearly doesn’t seem to think is a vast discernment-wing conspiracy or “illuminati type conspiracy” as Brown called it). While James White has been busy linking critics of Elephant Room 3 to the critics of the Interfaith Dialogue Debacle of Summer 2017, the truth is they are not really the same people. 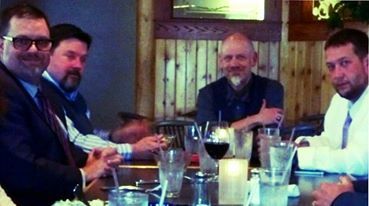 Phil Johnson, Justin Peters, and Chris Rosebrough – all of whom expressed some level of disagreement with at least the wisdom of the Qahdi dialogue – were the very ones defending James from the Howse-treatment and broad anathematization. All of those men, as well, have been grossly mistreated by Brannon Howse. White’s attempt to turn his Elephant Room 3 critics into the “Howsian Group” falls simply upon the face of its own absurdity. Here’s a fact for you; those who are speaking out about Elephant Room 3 are the very same ones who are experts on the NAR. Think about that. While White could argue that some of his IFD critics couldn’t compete with his knowledge of Islam (that’s not true for all of his IFD critics, by the way), White knows virtually nothing about the NAR. In fact, he acknowledged in the infamous Elephant Room 3 episode that he didn’t even know the teachings of Peter Wagner and Jack Deere, which is practically unbelievable for anyone vaguely familiar with the Third Wave of the Charismatic Movement – which any 21st century apologist really ought to know. Within minutes of Elephant Room 3 beginning, Rich Pierce had blocked Chris Rosebrough from commenting on their YouTube channel. That’s blocking the chief expert on the very topic of which you are most ignorant, which hardly speaks to White’s desire to present a truthful estimation of Michael Brown. If experts in the field of NAR are the loudest warning you…wake up.